President Donald Trump is expected to announce at a campaign rally in Iowa Tuesday that he will ask the Environmental Protection Agency to allow more ethanol to be used year-round in gasoline, a move that the administration says will benefit corn farmers in the state. Coming one month before the midterm elections, it could also benefit Republican candidates in Iowa and other farm states. The new rule would aim to allow sales of gasoline with 15 percent ethanol, known as E15, available year-round instead of only eight months a year. Current rules limit the sale of fuel with more ethanol in the summer because of concerns that it creates more pollution that could lead to smog when used in older cars. 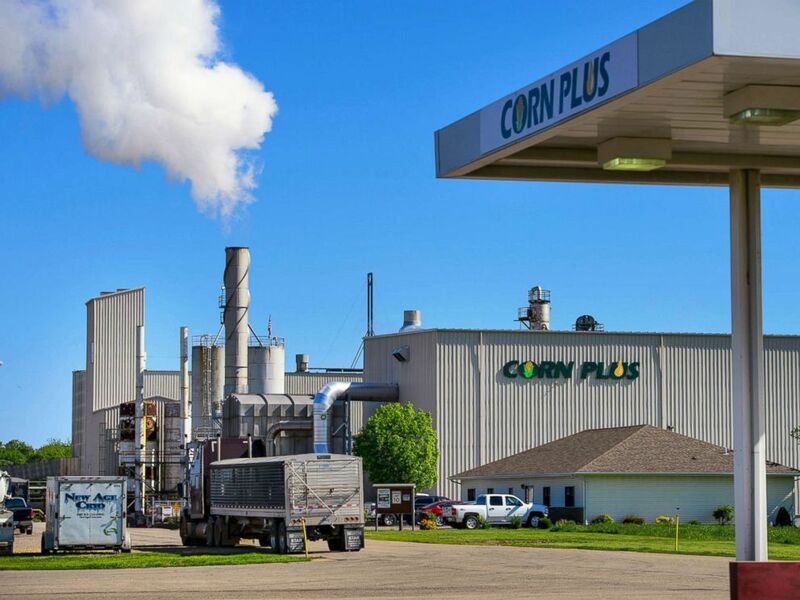 The Corn Plus ethanol plant on May 22, 2015, in Winnebago, Minn. The decision is expected to benefit farmers who grow corn, much of which is sold to ethanol producers, but has already been criticized by oil industry groups. "We're helping our farmers. And we're also going to be helping our refiners, and you know that too. Because they're both very important. But the farmers have been so terrific, and they produce great product. So I think it's going to be great," Trump said to reporters before traveling to Iowa. "There really is no negative impact. In fact, there are those that say you do this and the air is cleaner. I agree with that. But they say, you go 12 months instead of eight. You go 12 months, and the air is actually cleaner," Trump said. A senior administration official said the White House will also ask for changes to how oil refineries trade credits to mix ethanol into fuels and other changes to improve compliance with oversight programs and limit manipulation of compliance costs. When asked if the administration was concerned the rule could cause the release of more greenhouse gases that contribute to climate change, the official initially said the move isn't directly related to climate change and that the president supports fuel produced in the United States and that it helps the agriculture economy. "From 2005 to 2017 the U.S. carbon dioxide related emissions have declined 14 percent while global energy-related carbon dioxide rose by 21 percent in the same time period. so this becomes possible through the development of new affordable and cleaner technologies to capitalize on our energy abundance and this action is in line with that policy," the official said. Oil industry groups oppose moves to expand 15 percent ethanol, saying it can damage car engines leading to expensive repair bills. EPA says E15 can be used in all cars built since 2001 but the American Petroleum Institute said many car warranties won't cover damage from E15 fuel. The administration official said Trump's move specifically targets small refineries and they hope to have the changes in place before the next summer driving season.